I think Annabelle likes to give things a whirl three times. It took her three times to get extubated originally. And it looks like it will take us three times to “go home” too. First, she ran a fever on Christmas Eve, the day we were to go home. And yesterday, we were planning to go home and had everything ready AGAIN… and we are now back in the ICU as of yesterday morning. I’m believing the third time is a charm this time as well. I kinda wish if she wasn’t gonna go home… something would happen the day BEFORE we go home instead of the day OF… but God calls the shots, not me. And He knows what He is doing, even if it does make us scratch our heads sometimes. Scott and I came back to the hospital really late Saturday night, as we were trying to do the last few things at home to get ready for Annabelle. We got in about midnight, and the nurse was in with Annabelle as she’d been fussy (she’d been fussy on and off most of the day). The nurse left, and Scott and I settled in to sleep. The first fifteen minutes was quiet. I think that was the longest bit of silence the whole entire night. She was fussy, but no fever… gave her an extra dose of sedation because we’d just weaned the day before, but then she ran a fever… turned a little blue, we turned up her O2’s, she finally settled down, but then started coughing and had junk in her throat, so we suctioned… then the nurse said she’d take care of her a while so I could sleep, which I did for maybe 30 minutes (by now it’s about 6 a.m.) and then they were taking cultures and blood gasses because she still isn’t well and is still running a fever. Not sure if she has a virus, or just got extremely agitated from weaning sedation, or if this is left over from the Cath when she was intubated, as Annabelle tends to have a lot of extra secretions after she is intubated and has a hard time coughing them up herself. 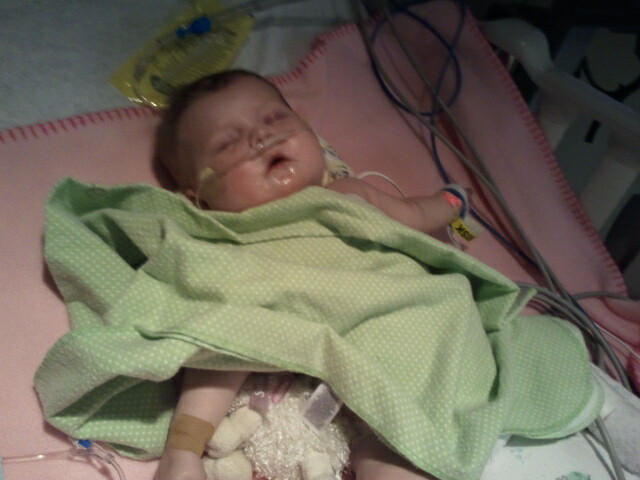 Since they can’t deep suction her on “the floor” and her blood gas was so bad, we were sent back down to the PICU. Hopefully though this is just a brief stay. She is resting comfortably FINALLY, but still pretty junky in her chest, and ran a small low grade fever briefly this morning. So far she’s tested negative for RSV and the Flu… but there are a whole host of other viruses it could be. Our prayer is that she’s doing awesome in the next day or two, goes back upstairs, and we can continue our journey home very soon. I have no clue what that time-frame will be now though. It just stinks to have to be stuck in the hospital due to what might just be a cold. Thank you for all your prayers. This has been such a long journey for our family, but God knows, and God is faithful. As many of you know, I like to write. The genre of my heart is Inspirational Contemporary Romance with a splash of humor. Mostly because I love sappy endings and I love to laugh and I love Jesus, so this just fits me well! A few months ago, I was sitting in Annabelle’s room, and had the itch to write. But my current work in progress was just not on my mind. So I sat down with a blank MS Word document on my screen, and began to type. I’d love to report to you that this wonderful novel was birthed and only God could have allowed me to write like that, but alas, the writing was pure and utter crap. The story was non-existent. It was just plain dumb. I won’t even tell you what it’s about, as I’d love to savor at least a little positive reputation. So scratch that idea for now. My initial reaction was to roll my eyes. The thought was ridiculous! And I admit, my reaction now is pretty close to that still. Let me explain a little why. Regardless of the whole “not a non-fiction” girl I am… I’ve studied enough about the publishing world to know that there are certain criteria needed in order to “publish” a non-fiction book. The biggest, most important one is this: Platform. About equally important is a unique hook for your book. Platform boils down to this principle: How many people “know” you and will buy your book because of your name? Do you go “speak” at engagements with thousands of people and are able to “sell” your books yourself? Publishers these day want at least some guarantee of sales. Sometimes I think God is telling us to “share” what we’ve learned with people, and the most obvious choice is through a book. But sometimes, maybe it’s just sharing with a neighbor… or through a blog… or with a women’s group at church… Sometimes God uses little ways to do big things. It doesn’t have to be on a grand scale. All the “reason’s not to” aside… two people came to me this last week and mentioned that it’s been on their heart to tell me that God wants me to write a book out of this. Again, my initial reaction is, “Um, No.” For all the reasons I’ve mentioned. But at the same time, I’m a big believer in not telling God “No” if he’s really calling you to do something. And the more I wrestle with it, the more confused I get. I really do NOT have a clear direction as to whether this is something God wants me to do. But your prayers, mainly for Annabelle, are appreciated, but also for my family, and for me to be obedient to God in WHATEVER he calls me to do. 20 bucks says that Matt writes a "song" about baby Bowen because he is a " song writer" and that is what God has called him to do. So…. I wonder if a "book writer" experiencing the same thing should "write a book" about what she experiences because that is what God has call her to do. Hummmm… Your loving sarcastic sister! It's Jami… Not Julie stupid Gmail!!! So… maybe I should just write a mini-book and publish it on PDF on my blog for anyone who wants to read it. Just because I write one, doesn't necessarily mean I have to "sell" it, hmmm? Although that is a LOT of work… LOL Selling it WOULD be a plus! I am the mother of four boys, one of whom had heart surgery at 2 months. His was a minor operation (PDA). I came across your blog thru Bowen's. There is a little girl named Caroline who lives in our town who is getting ready for her third surgery for HLHS. I have watched and prayed for baby Annabelle to see if she made it home for Christmas. I think a book about your journey is a great idea. You are so blessed to be so talented. I am sure one day another mother of a child of HLHS would learn so much from a book by you. I look forward to reading your other books in the future. First of all, continuing to pray for Annabelle and your family. Second, who said it had to be a non-fiction book? You can weave the lessons learned and the story of of what you have gone through into a novel. I'm like you, I process better through story than I do through non-fiction. Jesus spoke through parables on many occasions for just that reason, people often relate to 'stories' and 'stories' are often based on reality, just told through the parable medium. Have you considered starting a blog specifically devoted to kids/parents who are touched by the same kind of issues Annabelle has? Write each post as you would an entry in a non-fiction book, cataloging your experiences, offering a place for parents in a similar situation to come and get information and talk about stuff. Gather other folks's stories and their input, gain a following and become an 'expert' in this area (not all the medical stuff necessarily, but in the parenting side of it.) Express your fears and joys and longings, the frustrations and milestones and setbacks, just as you have here, but with a blog name and focus that will drive people to your site if they are looking for information on Annabelle's particular heart ailment. Praying that you and Annabelle will be home soon! Sorry about Annabelle's struggle to go home. I'm praying! PS I have seen this book in print in my visions from Heaven, and also saw you appearing on Christian television shows…and secular ones also, as people want to meet you and hear your message! I'm wondering if the fever could be teething? Have they ruled that out? Just a thought. I came across your blog through Bowen's and am praying for both daily. Doctor's say that babies don't have fevers because of teething. problem is, even if it IS teething… Fevers make her heart work more and her heart is already working very very hard. So fevers even if they are from teething… are very dangerous for my annabelle! I've read all the other notes as well… THANK YOU! Am still thinking and praying over each suggestion and note of encouragement! I believe the Lord gave you the gift to write and gave you Annabelle. One doesn't necessarily equal the other but they sure do make sense. You can relate to others in your predicament far better than most people. I say why not? i stumbled onto your blog from a link of a link…..and to make a long story short, your blunt honesty and real faith is refreshing to me, and such and encouragement. your real feelings shine thru, and i can totally relate to you! thanks for being a beacon of light to other christians, and thank you for being so real about your feelings. even when you are down, your faith shines thru. i have to say, your blog makes me feel like we are two friends having a heart-to-heart. please know you and your family are in my prayers, and when things are tough for you and your sweet sunshine baby, we feel your paing and help carry you thru on wings of prayer!!! Krista, I think the call to share your story has been placed on your heart for a reason. Whether you choose to write a non-fiction book, a memoir, or a fictionalized story, you're living the research. I think Erica had some great advice. Silly Annabelle…I have a feeling she'll cooperate for you very soon. Wow- each one of these were in my heart. They were put a lot better then wht i can write. Anyhow. I read somwhere how the enemy causes confusion when the Lord is getting you redy for somthing big, The other one does not want you to sucseed. You will sucseed. before you wrote about this i said wow her heart touches mine Lord i wish she can take all these blogs and put them in a book. Anyway, I hope you can see wht i mean I am not a writter. Also continuing to Pray for Annabelle, Your other daughters were in my heart as well. I pray for your whole family. Mostly that you feel Gods preseance and Peace. Psalm 91 over you and your family..